Dan prepares to record the walls of Structure One by rectified photography. As many of you already know, the pottery at the Ness ranges in size from the gigantic to the tiny. Today, we bring you news of one of the smallest complete pots. It is, indeed, very small but very attractive. It has three, little, raised lugs, sitting on top of the rim and is a copy in miniature of similar vessels from the site which are usually amongst the largest we find. In archaeology, however, context is everything (almost) and the context in which this exquisite little pot was found is of particular interest. It was discovered inside the blocking of the south entrance of Structure One and the removal of the blocking today has revealed, not just the pot, but a fascinating entrance area. The entrance through the outer revetment is wide, but then is stepped to form a narrow short passge, but then swells out to create a space of impressive proportions which includes incised stone to the side, and which is part of the primary building phase of the structure. The elaboration of this area continues to the interior where there is two bar holes in an upright slab to one side, presumably for a screen or door. This is in stark contrast to the north entrance, which is decidedly plain and simple. In Structure Ten, Mark, Claire and Jan’s exploration of the badly stone-robbed area reached the part of the wall close to the entrance, only to find that even the largest basal stones have been taken, revealing yellow clay, which presumably constitutes the platform on which the structure was built. 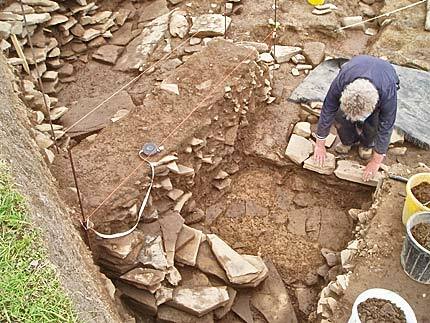 This platform construction is similar to a number of Neolithic structures, including Maeshowe, and may bring an element of waterproofing to the building on which it is placed. 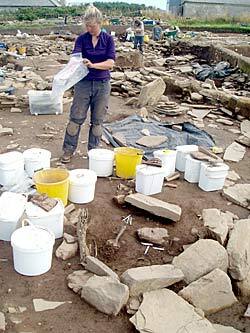 Georgie surrounded by a sea of sample buckets tackling her Neolithic loo. Regular readers will know of Georgie’s extraordinary dedication to Structure Seven, which she has occupied for what must seem most of her life. Attempts have been made to tempt her away, with offers of juicy sections and the prospect of polished stone axes and other goodies. She has, however, turned her face from such temptations and has persevered. Now, with the removal of Structure Seven and the descent on to what has supposed to be Structure Nineteen, her perseverance has paid off. She has discovered a paved alcove, which has a small drain running out of the back, which may have been intended to exit near the culvert drain between Structures One and Nineteen. Site director Nick has seen something like this before, specifically at Crossiecrown, just outside Kirkwall, where such small alcoves, with drains, in houses were interpreted as potential toilets. A notable visitor today is Dr Cathy Batt, from Bradford University. Cathy has a long-standing involvement with the Ness and is here to take more samples from the hearths in Structures Fourteen and Sixteen. This will provide a vital sequence of archaeomagnetic dates which will be further refined to significantly increase the dating evidence for the site. Lastly, and sadly, we say goodbye today to Professor Scott Pike, and his team of students, from Willamette University, in Oregon. The students have, as ever, been a delight and have worked hard, and profitably, through pouring rain and blistering sunshine. Everything they have done has been accomplished with humour, goodwill and impressive determination. Scott, whose professional contribution is hugely valued, will be back next year with more students. We wish them safe home. Please note that there will be no excavation or blog tomorrow (Friday) as we will having our Open Day this Sunday from 11am to 4pm, with continuous site tours – do hope that you can join us. Mark reveals the clay platform under the wall of Structure Ten. Hello! You are now hearing from Lauren Dudley and Emily Arnold of Willamette University. We are both studying archaeology and this program is a portion of our field work experience. Today is our last day on site and we have managed to put off writing the blog until now. But Nick found our guilty, non-blogger faces. Four weeks ago, we arrived in the Orkney Islands in pursuit of our dreams of becoming the best archaeologists of all time. We weren’t entirely sure what to expect, due to what pop culture presents to us as archaeology, using Indiana Jones and Lara Croft as our primary examples. What seems to have been true so far is that you get very dirty, just like Indie, and create heaps of spoil for others to clean up. Paperwork was less than exhilarating and it was quite a downer when we realised hand-to-hand combat wasn’t a part of our training. 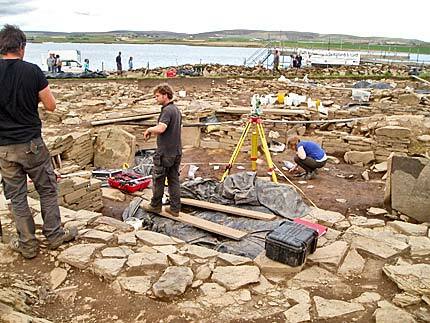 All jokes aside, the Ness of Brodgar has exceeded our expectations and has greatly increased our knowledge of the archaeological process. Stewart and Chris contemplate the next move for the removal of the blockiing in the south entrance to Structure One. 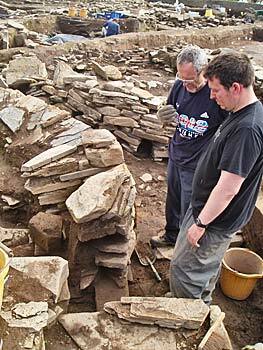 We have been working in the newest trench, Trench T, which generally is not viewed by visitors to the Ness. The first two weeks involved mostly trowelling, followed by mattocking our perfectly troweled surfaces into oblivion. During one of these mattocking and troweling adventures, we uncovered what we call the legendary Crack of Doom. It suddenly appeared in the northeast corner of Trench T in a large midden deposit. It continues to grow in size and has a depth of about a meter. It also sounds hollow when our trench supervisor, Ben, jumps on it. He is all about health and safety. Once the major excavation process stopped, we moved on to the more logistical aspect of our education while at the Ness. This included sampling, planning, levelling, and writing the dreaded context sheets. During these more complicated exercises, we really got the chance to see the many cultural and linguistic differences between our two great nations. Some that never fail to arise is the confusion of pants versus trousers, apple pips and apple seeds, and tank tops and vests; also the use of our backwards American non-metric system. And when we are measuring numerical values and Ben says, “nought”, it doesn’t necessarily mean not. These misunderstandings happen on a daily basis but it makes life in the trenches more interesting. This is the last blog entry by Willamette students of this year because the last tea time of the day has been called and we only have two hours before our four-week stint at the Ness comes to an end. Soon we will have to leave all the wonderful people working at the Ness. We are incredibly thankful to be given the opportunity to study here and experience the beautiful islands of Orkney, no matter how rainy it may be.